You are not in your own body. You can remember snatches of your past, of a heavenly existence, and of a terrible fall from grace, but no more. This place is only fleetingly familiar. The thing that calls itself Ghede has told you that you were once something more than human; you were a god, a post-human, one of the Loa. But times change. You committed a crime, and you were exiled. This is where you are - the Flame Worlds, a hazily remembered place of death and intrigue, among billions of souls trapped in this mundane existence. You and your fellow Exiles must accept Ghede's offer and meet others of your kind to do his bidding. What will you discover among the Flame Worlds? Who knows, but if it ends your exile, it is worth it. 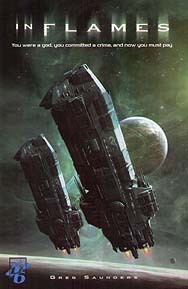 In Flames is a science fiction role-playing game of action, adventure, psychosis and discovery utilising the D6 System.